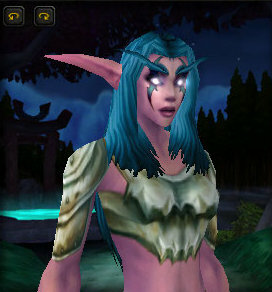 A quick post showcasing some of the chestpieces I've been picking up while leveling through my 40s in Kalimdor as a night elf warrior. First off is the Swindler's Vest, (seen above) uncommon (green quality) leather agility chestpiece. What it looks like: It is a detailed leather vest which is open in the front with some really cool belts and buckles holding it closed. It has fur (perhaps feathers?) as a fringe along the bottom. Where to get it: You obtain this from the quest Back to Riznek in Thousand Needles which involves obtaining oil rights from a group of Centaur. While Wowhead is showing this as a Horde quest there is an Alliance equivalent (which I did seeing as I'm Alliance). Find more midriff armor (and a creepy bonus item) after the jump. Next up is the Tyrant's Chestpiece, uncommon plate strength/agility chest which requires level 43. What it looks like: A bronze chestpiece with read trim. It covers the chest area almost exclusivel leaving the midriff exposed (not much protection there). The bottom is areas are somewhat pointed and it includes forearm coverings with what appears to be a thorn pattern. Where to get it: This was a drop obtained while killing MOBs in the mid 40s or so. May also be available on the auction house. What is looks like: Has the appearance of tarnished silver. Leaves the midriff exposed. Has the appearance of multi-part plate armor over the shoulders. 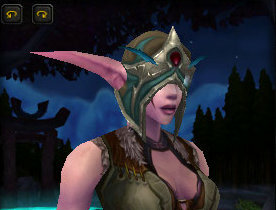 Creepy bonus item: Hood of Disgrace, uncommon cloth headpiece. What it looks like: While this is a cloth headpiece it has the appearance of gleaming metal at the front. It has a read gem at the forehead and an olive cloth back cowl with shiny green horn'like detailing near the front. The most striking feature of this headpiece is that there appears to be no eye holes which gives is an extra creepy "cultist" like feeling to it. If you fancy your character a magic user so strong that sight is irrelevant than this might be the cowl for you. Where to get it: I obtained it from the level 43 quest "Grimtotem Chiefs: The Chief of Chiefs" in Thousand Needles. Shares a look with: Here is a link to 8 cloth headpieces that share a similar look. They all appear to bind when picked up.